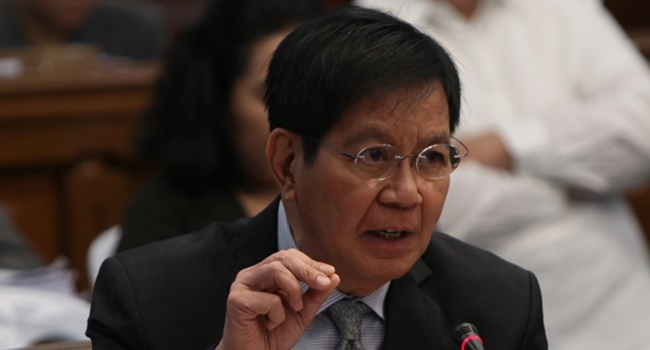 LACSON – Senator Panfilo Lacson wants the funding of CHED’s Tulong Dunong program removed and realigned, questioning its budget allotment. Previously, when he checked the initial perusal of the appropriations bill, it showed that two lawmakers, in which both were members of the House of Representatives, were receiving at about ₱1.5 billion each, which is more than the ₱60 million promised by Speaker Gloria Macapagal-Arroyo. The senator aims to identify them in a plenary debate on the general appropriations bill, which is scheduled this week. His reason is because all that will come out during interpellation will just to prove his point that the two members touched the national expenditure program. Recently, on Wednesday, during the plenary debate of the proposed 2019 budget, Lacson questioned the budget allotment to the Commission on Higher Education’s Tulong Dunong program. According to Inquirer, Tulong Dunong allows lawmakers to implement projects and identify beneficiaries, in which the Supreme Court declares such practice unconstitutonal, says the senator. He further said that he questioned the said implementation due to the reason that only legislators are allowed under Tulong Dunong to implement projects. As per the report, the Tulong Dulong program aims to provide financial assistance to tertiary (college) students, in which this is considered redundant as the Congress already passed the Free Tuition Act. This is the reason why Lacson wants the program deleted and realigned. What do you think? Let us know about it.